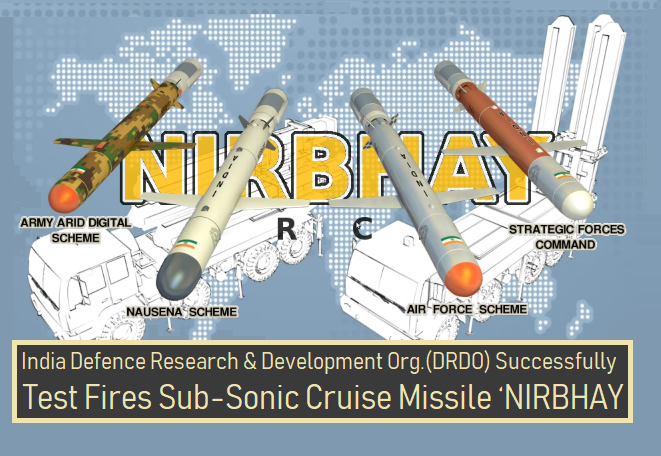 India Defence Research and Development Organisation (DRDO) successfully test fired indigenously designed and developed Long Range Sub-Sonic Cruise Missile 'Nirbhay' from the Integrated Test Range, Chandipur Odisha. It is the sixth development flight trial with the objective to prove the repeatability of boost phase, cruise phase using waypoint navigation at very low altitudes. The missile took off vertically turning horizontally into the desired direction, booster separated, the wing deployed, the engine started, cruised all the intended waypoints. According to Army chief General Bipin Rawat, Indian army is planning to carry out joint training and exercise with the Indian Coast Guard. General Rawat commissioned the coast guard's offshore patrol vessel (OPV) Veera, the third in the series of the new-generation OPV in Visakhapatnam yesterday. Veera (97-metre long and 15-metre wide) will help the coast guard monitor maritime boundaries more effectively. The Veera has a range of 5,000 nautical miles and can attain a sustained speed of up to 26 knots. It is armed with two 12.7-mm heavy machine guns (HMGs) and a 30 mm-naval gun with the fire control system. Finland's leftist Social Democrats have recorded a razor-thin victory in general elections, holding off the far-right Finns Party. With 100 per cent of ballots counted, the Social Democrats, led by Antti Rinne, bagged 40 seats in the 200-member Parliament, while the Finns Party picked up 39 seats. His Centre party was the election's biggest loser, blaming the difficult economic decisions his administration made to rebalance the economy. The world's largest aeroplane designed by Stratolaunch with two fuselages and six Boeing 747 engines, made its first test flight in California, USA. It is designed to carry into space and drop a rocket that would ignite to deploy satellites. The Union Cabinet has given its approval to create one post of Deputy Comptroller and Auditor General (Coordination, Communication and Information System) in the Office of the Comptroller and Auditor General of India. The Deputy CAG shall oversee the coordination among state audits, audit of telecommunication and coordinate the various information systems initiatives within the Indian Audit & Accounts Department (IA&AD). The Union Cabinet has approved the continuation of the GSLV Phase - 4 programmes consisting of five GSLV flights during the period from 2021 to 2024. The Phase - 4 will enable the launch of two tonne class of satellites for Geo-imaging, Navigation, Data Relay Communication and Space Sciences. The programme will meet the launch requirement of satellites for providing critical Satellite Navigation Services, Data Relay Communication for supporting the Indian Human spaceflight programme and the next interplanetary mission to Mars. The operationalization of GSLV has made the country self-reliant in the launching capability of 2 tonne class of satellites for communication and meteorological satellites. The Election Commission has barred Uttar Pradesh Chief Minister Yogi Adityanath (72 hours) and BSP chief Mayawati (48 hours) from poll campaigning over violating Model Code of Conduct by making objectionable statements in speeches. Mayawati for her speech in Deoband appealing to people of a particular religion to vote in favour of SP, BSP and RLD alliance. Haryana Chief Electoral Officer Rajeev Ranjan has inaugurated India’s first-of-its-kind ‘Voter Park’ in Gurugram, Haryana. At the park, voters will get information about the polling process and the history of elections in the country. The objective of establishing Voter Park was to motivate eligible people to vote in the Lok Sabha election so that they can contribute to the progress of the country. The Department of Telecommunications (DoT) has approved the merger of Tata Teleservices with Bharti Airtel Ltd., subject to the condition that it furnishes a Rs 7200 crore bank guarantee. Earlier, Telecom Minister Manoj Sinha gave his conditional nod for the merger. The guarantees are mostly related to one-time spectrum charges (OTSC) and some deferred airwave charges, according to people aware of the development. The merger will be taken on record after Airtel submits a bank guarantee of about Rs 6,000 crore for one-time spectrum charges and another Rs 1,200 crore for the spectrum that would be acquired from TTSL. The proposed merger will include the transfer of all the customers and assets of Tata CMB to Airtel. An image of a two-year-old little girl crying, as she and her mother have been taken into custody by US-Mexico border officials in Texas won the prestigious World Press Photo of the Year 2019. Veteran Getty photographer John Moore took the picture in the Rio Grande Valley in June 2018. The photos are judged for their accurate, fair, and visually compelling insights about our world. The World Press Photo Foundation has recognized the best contributions to visual journalism by professional photographers through its international World Press Photo Contest. The winning photos of the World Press Photo Contest 2019 will be shown in exhibitions around the world starting in Amsterdam from 13 April until 7 July 2019. Dr A K Singh, Director at Life Sciences has been honoured with Lifetime Achievement Award 2019 for contributions in life sciences, aerospace and aeronautics at Chandigarh University, Mohali. The conclave was organised by the university to note World Creativity and Innovation Day. The DST scientist has more than 18 patents and has contributed to more than 57 research publications at an international and national level. To detect the infectious lesion, he discovered a “Diagnobact” Kit. and introduced Pharmacosyntigraphy, i.e. application of nuclear medicine imaging in drug research. The Swedish actress Bibi Andersson (83-years) passed away at Stockholm, Sweden. Bibi Andersson had received several awards including the Silver Bear for Best Actress at the Berlin international film festival in 1963. She is best known for starring in many of Bergman classics including The Seventh Seal (1957), Wild Strawberries (1957) and Persona (1966). Renowned Hindi poet Pradeep Choubey (70-years) passed away at his home in Gwalior. Choubey (70) was the younger brother of the celebrated humorist, satirist and poet Shail Chaturvedi. He quit his job at Dena Bank to pursue his passion for poetry and travelled across the nation enthralling audiences with his punches, several of them targeted at the orthodox elements of society. Mr. Choubey born in Maharashtra's Chandrapur district, Choubey shifted to Gwalior. India announced their 15-man squad for the ICC World Cup to be played in England from 30th of next month. Virat Kohli will lead the team. Dinesh Karthik (33-year-old) returned to India's World Cup squad after 12 years for the second wicket-keeper's slot. Tamil Nadu all-rounder Vijay Shankar made it for his three-dimensional qualities. Virat Kohli (C), Rohit Sharma (VC), KL Rahul, Dinesh Karthik, Shikhar Dhawan, Kedar Jadhav, Vijay Shankar, MS Dhoni (WK), Mohammad Shami, Bhuvneshwar Kumar, Jasprit Bumrah, Kuldeep Yadav, Yuzvendra Chahal, Ravindra Jadeja, Hardik Pandya.